Vampires plus Daisy = spooky trouble! Drinking blood is just the start. (Ugh.) Do you love Halloween? Daisy isn’t sure she does. She’s gone trick-or-treating for the very first time. In the dark. In the fog. Armed only with a torch and some silly string. With a VAMPIRE nearby. GULP! 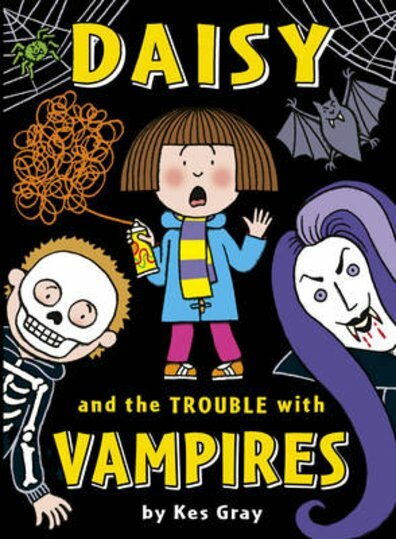 Jack’s blood-curdling stories about vampires, ghosts and werewolves are scaring Daisy silly. But we reckon she needn’t be nervous. We bet all the vampires are hiding in their coffins tonight, and all the ghosties are sucking their thumbbones. Why? They’ve heard that crazy Daisy’s about! Can you colour in this picture of Daisy and her mum? Daisy is lost in the middle of a maze! Can you help her escape? Kes Gray has won the Lollies for Oi Dog!, the Red House Children’s Book Award for Daisy and the Trouble with Zoos, Eat Your Peas and Billy’s Bucket.